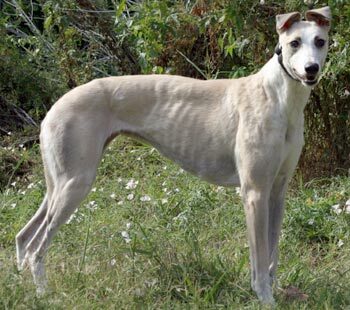 Marilyn is a beautiful 2-year-old light fawn female born August 1, 2007. Her sire is the Irish-bred Team Record and her dam is HK’s Carolyn, making her grand sire the late famous Gable Dodge. 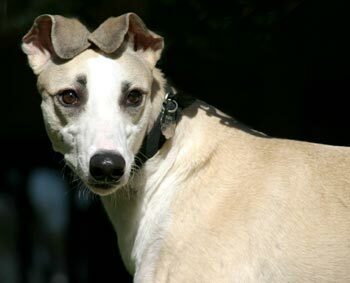 Her litter consisted of 3 males and 3 females, but only the males were named and registered with the National Greyhound Association. She is the “F” pup. Marilyn was found as a stray in Amarillo, TX. As with so many strays, Marilyn tested positive to Ehrlichia. She was treated accordingly for 10 weeks under the care of Dr. Jeff Ellis and Dr. Christy Soileau of VCA Preston Park Animal Hospital. Marilyn was given a PCR (Polymerase Chain Reaction) test to determine a positive or negative result for an active infection. Marilyn’s test was negative, so she is ready to find her forever home! Marilyn's cat test: Marilyn passed her cat test today! She was quite curious at first, but made no indications of wanting to snap. She got a better sniff without the muzzle, but turned away afterwards. Next, we put the muzzle on, but let her off leash. She seemed to have gotten enough info from sniffing the cats that she didn't have much interest. She was allowed quite a bit of time off leash and without the muzzle in the house. She got along greyt with the other hounds of the house, too. Marilyn is a little shy and reserved. She is in a foster home with other greyhounds, and is adjusting to home life. When I picked up Marilyn from the GALT vet, she had a heavy coat and appeared to be a white dog with some ticking. 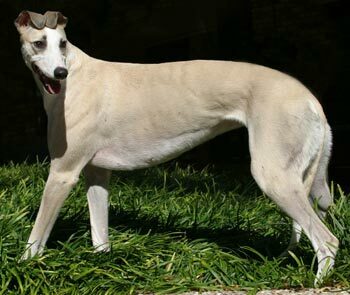 While she was on Injured Reserve for Ehrlichia, we were able to uncover her true beauty - light fawn with white knee socks and tail end, with exotic dark black eyeliner - a dramatically stunning girl! Marilyn was a little nervous the first few days in my home. After she realized that she had survived her bath, she clearly felt more at ease. She'd follow the pack and usually come upstairs with us, but her favorite spot was a corner of the landing where she could look out the window. Marilyn spent the first couple of nights in the crate, but then she decided she really wanted to sleep with the rest of us. I set up a bed for her in the bedroom, and that's all it took; she hasn't looked back. Of course, now she complains if I close her in the crate that she once craved so much. My favorite Marilyn thing is that she will do a backwards hop-and-jump when it's time for her dinner. Dinner time at my house usually starts in the kitchen (with add-ons to the dry food), and then proceeds to the dogs' dining room, where they eat in crates. As I carry Marilyn's bowl to her crate to feed her, she backs up in front of me, hopping and jumping all the way. What a silly girl! She's the fastest eater of all the girls, and not picky at all. We are making progress with leash training, but Marilyn will give you a workout because she sometimes seems to be afraid of just about anything or anyone we encounter. She is, however, a great watchdog! If someone is talking outside - day or night - she'll go out through the dog door to welcome them to the neighborhood. She will stop barking if you tell her "quiet" and she will always come back inside if you just invite her to rejoin the gang. Once this sweet girl gets in her comfort zone, she can get quite playful. Marilyn can be hesitant in new situations. She doesn't shake or tuck her tail up; she just observes from a safe spot. She's still a little leery of sudden loud noises - like the weather alerts that pop up on my PC - but once she knows they are not threats, she adjusts easily. Marilyn would love to have other hounds in her home. She not only takes her cues from them but she really enjoys playing with them. 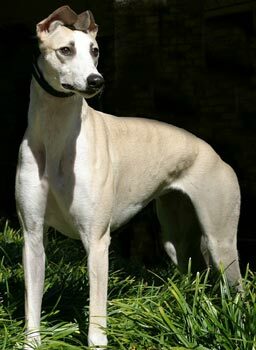 She and my young Greyhound can sound like a thundering herd as they race up and down the stairs in a game of what appears to be Greyhound tag.